The UEFA Europa League was previously called the UEFA Cup. The Uefa Europa League for European football clubs is the second most prestigious European club football contest after the UEFA Champions League. Manchester United are the current champions of the UEFA Europa League competition. They beat Dutch team Ajax. The most successful clubs in the UEFA Cup competition is Sevilla FC, all with five titles. Who will win the UEFA Europa League this year? Some of the favorites for winning the UEFA Cup this year include Athletic Bilbao, Valencia and Sporting Lisbon. Buy UEFA Cup tickets, Champions League tickets or Champions League final tickets now and see world's best football players alive! 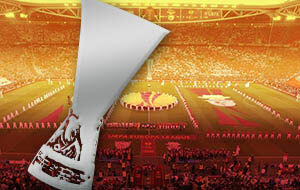 Not only we have tickets available for UEFA Cup knock-out matches, but also we offer UEFA Cup Final tickets. All ticket orders are 100% guaranteed.